What are Hammer crusher advantages and drawbacks in stone crushing plant? NewsHome > News > What are Hammer crusher advantages and drawbacks in stone crushing plant? Hammer crusher is primary and medium crushing equipment in stone crushing plant, which is consisted of hammer,grate, rotor,lining plate and screen plate.Hammer crusher is suitable for crushing materials with comprehensive strength less than 180 Mpa, such as limestone,coke,slag, coal gangue, shale and gypsum etc. The maximum feeding size of hammer crusher is below 350mm.Great Wall Company stone crusher experts conduct the conclusion of hammer crusheradvantages and drawbacks in stone crushing plant. Hammer crusher is known for its strong crushing capacity and high efficiency, It is convenient to operate and maintain and which is reasonably design with very competitive production cost. Every coin has two sides, there are also some drawbacks of hammer crusher.Firstly the hammer,rotor and lining plate wear fast in stone crushing plant.If we do not install the iron protection device, accident always appears in the crushing cavity when metal falls into hammer crusher. 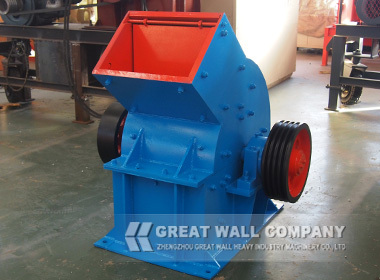 On the second, when moisture containing rate is above 12% in crushing process , There are jams in the grate and greatly reduces crushing capacity and waste energy consumption.If hammer crusher operator do as the operation manual and do the inspection for hammer crusher at fixed interval, we can guarantee hammer crusher durable service life and excellent performance.